Sarah Paulson leads the way as she and Holland Taylor arrive at Pizzeria Il Fico Restaurant on Saturday night (March 30) in Los Angeles. The 44-year-old American Horror Story actress looked pretty in a black blazer and a polka-dot blouse while the 76-year-old former Two & a Half Men actress sported a striped sweater for their low key dinner date. Sarah has been busy these past few weeks filming her upcoming Netflix series Ratched. The upcoming series, co-produced by Sarah and Ryan Murphy, is set to debut in 2020 and follows a young nurse at a mental institution who becomes jaded, bitter and a downright monster to her patients. Rita Wilson steps out in a gray, snakeskin-print suit as she attends a screening of Gloria Bell on Wednesday night (February 27) at The London in West Hollywood, Calif. The 62-year-old actress was joined by co-stars Holland Taylor and Brad Garrett along with director Sebastián Lelio as they stepped out to promote their new movie. The movie – which stars Julianne Moore – follows a free-spirited woman in her 50s who seeks out love at Los Angeles dance clubs. Gloria Bell hits select theaters on March 8. 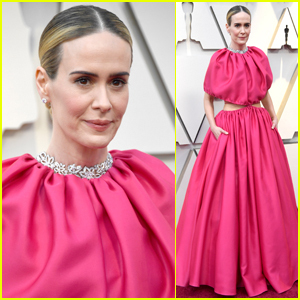 Sarah Paulson stuns on the red carpet as she arrives at the 2019 Academy Awards on Sunday (February 24) at the Dolby Theatre in Los Angeles. The 44-year-old Ocean’s 8 actress looked super chic in a fuchsia-colored gown as she was joined on the red carpet by longtime love Holland Taylor. Sarah will be hitting the stage during the show to present an award. FYI: Sarah is wearing a Brandon Maxwell dress, Harry Winston jewelry, and Brian Atwood heels while carrying an Edie Parker clutch. Drew Barrymore enjoys a break in between scenes for her new movie The Stand In on Tuesday afternoon (February 19) in Rockefeller Center in New York City. The 43-year-old actress sported a milkmaid costume while wearing a blonde wig with pigtailbraids as she was joined on set by co-stars Ellie Kemper and Holland Taylor. In the film, Drew plays two characters – Candy and Paula – who rely on each other to get through their difficult lives. Sarah Paulson wears a big red coat while arriving for an interview on The Late Show with Stephen Colbert on Thursday (January 17) in New York City. The 44-year-old actress was joined by her partner Holland Taylor at the studio. Sarah made an appearance earlier that day on Live! with Kelly & Ryan to promote her new movie Glass. Sarah is also in the Netflix movie Bird Box and she spoke out this week against the #BirdBoxChallenge, in which fans have been blindfolding themselves and trying to walk around like the characters in the movie. Sarah Paulson & Anya Taylor-Joy Look So Chic at 'Glass' NYC Premiere! Sarah Paulson and Anya Taylor-Joy walk the purple carpet at the premiere of their new movie Glass on Tuesday (January 15) at the SVA Theater in New York City. The ladies were joined at the event by co-stars James McAvoy, Bruce Willis, and Samuel L. Jackson. Sarah‘s longtime girlfriend Holland Taylor attended the event, as did her friends Zachary Quinto and Pedro Pascal. Make sure to see Glass when it hits theaters on Friday! FYI: Sarah is wearing a Calvin Klein 205W39NYC dress and shoes with Ana Khouri jewelry. Anya is wearing a Dolce&Gabbana suit, Christian Louboutin shoes, and jewelry by Effy and Jemma Wynne.